While helping people declutter their homes, I tend to have a “love-hate” relationship with their piles of phone books. Why do I love them? 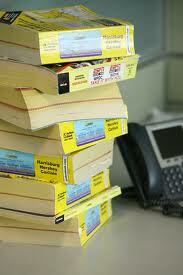 Well, phone books used to be one of my biggest forms of marketing for my business! Before internet search engines were the trend, people used to find me in the “Home Organizing” section of their local yellow pages.You see, there have been many times that I have stumbled across a client’s phone book while cleaning out their home office and secretly wanted to wrap my arms around it and whisper sweet words of appreciation to its dust covered pages. It’s because of that beautiful book that I am in business still today! So why do I hate them? They take up prime real estate storage space in all my clients’ homes! Here in the Seattle Area, it seems like we have a dozen different types of phonebooks for each county, city, region, etc. The problem is that most people don’t know which ones to keep and which ones to get rid of.Furthermore, they all have different delivery dates, so it always seems that every month there is a new one to add to the pile. The worst part is that most of these directories that we all feel obligated to keep end up going to waste! How often do you thumb through your local phone directory? While some people do prefer the paper ads, most people go straight to the internet to search for reviews of local businesses. Even I have had to end my long standing account with Yellow Pages because I was simply not getting any phone calls from the paper books. Seattle Public Utilities put out a report that states that every Seattle household gets as much as 100 pounds of junk mail and 7-8 pounds of phone books each year – a total grand total of 17,500 tons citywide! By opting not to receive unwanted phone books and junk mail, you’re not only saving space in your home, but you’re also saving trees!